If you're looking for a speaker that's less than $100 to bring to the beach or pool, the Flip 4 is a great option. The JBL Flip series is one of the most popular lines of Bluetooth speakers for a few reasons. For one, they’re usually not that expensive. In fact, I think every one of them has been priced at less than $100 brand new which isn’t bad at all. They also don’t sound bad and are now completely waterproof. So how much better can they make it without raising the price? We’re taking a look at their newest Flip 4 to find out. In the box you’ll get the speaker, a bright orange charging cable, and the instruction and warranty information. At first glance, there isn’t much about the new Flip 4 that sets it apart from the previous Flip 3, and that’s because besides a few minor design changes like the phone button being turned into a more fitting triangle for pause or play, there really isn’t too much different between them. The Flip 4 is still cylindrical in shape with exposed passive bass radiators on either end. That said there is one key difference that makes this a worthy upgrade to the previous model – waterproofing. The fabric that wraps around the speaker might look fairly similar to the previous model, but it’s actually completely waterproof now. It’s IPX7 waterproof to be exact, which along with being able to be submerged for 30 minutes in up to a meter of water, also means that’s sealed against dust, dirt, and sand. So taking this to the beach was no problem. I was able to toss it around in the sand and in the water and then just wipe it off, throw it in my bag, and keep on moving. It’s probably not a huge deal for you if you have a Flip 3 and haven’t ever dropped it in water (or even had it near water for that matter), but it’s good knowing that whether you drop it in the pool or in the ocean you won’t have to replace the speaker. 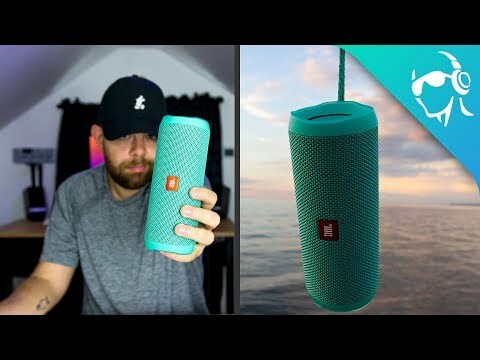 On that note this speaker still doesn’t float like the UE Wonderboom we recently reviewed, so if you do accidentally drop it into a pool that thing is sinking to the bottom. And if you’re in the ocean just kiss it goodbye. But besides that the rest of the speaker hasn’t changed much. You’ll still get the four playback control buttons along the side of the speaker, and the power button and JBL Connect+ along the spine. That’s also where you’ll get the five indicator lights that show you how much battery life is left along with a small flap to keep water out of the micro USB charging input and the 3.5mm input hidden underneath. The string is also still there so you can hang it from a hook or tie it to your bag if you want. Though I prefer the flexible cord you’ll find on something like the UE Roll, the string here is fine. Let’s circle back to that JBL Connect+ plus button for a second because this is one of my biggest complaints with this speaker. If you remember the Flip 3 also had a JBL Connect button, but this one is Connect+ and that extra plus sign makes a huge difference. While the old one could only connect two JBL speakers together, this new Connect+ button can connect up to 100. Pretty great, until you realize that you can’t connect to any previous speaker that doesn’t have Connect+. So if you have another speaker and were hoping to connect the Flip 4 to it you’re out of luck. This is a real bummer because the Flip series isn’t so expensive that it’s impossible to imagine someone buying one every time a new one comes out, and now they can’t even connect them together. Supposedly this is going to be fixed in an update but I don’t think it should have been overlooked in the first place. Okay rant over. Besides that, I’ve had no issues with the connection aspect of this speaker. The signal stayed strong regardless of where I was in the house, which practically means about 50 feet with a few walls in the way and the playback controls also work very well and give you plenty of control. You can control volume with the plus and minus sign buttons, pause/play music or access your phone’s personal assistant with the play button, skip to the next song by double tapping the triangular play button, and easily enter Bluetooth pairing mode with a dedicated button. All of this works perfectly and I had no complaints, though I do wish I was able to return to a previous track by triple clicking. That’s always helpful to me since I like to listen to the same songs over and over again during testing. JBL claims a battery life of about 12 hours, but in our initial testing, we got exactly 4 hours on max volume. Yeah, big difference. But the reason is because I feel like most people using a waterproof Bluetooth speaker is going to be using it outdoors, where it’s probably going to be on max volume. So that’s how I test it. However, when I lower the volume to between 50-75% it reaches 12 hours easily. So that’s something to keep in mind if you think you’re going to be out somewhere like the beach. For a few hours you won’t have a problem, but if you’re planning a day trip or a day by the pool you might want to avoid high output or the speaker isn’t going to make it. If you were looking for the Flip 4 to be a huge improvement in terms of sound quality over the previous model, I’m sorry to disappoint. The Flip 4 sounds very similar to the previous model. Now that isn’t a knock against the Flip 4 in any way because I really liked the sound of the Flip 3. There are only a few subtle differences here as far as I can tell, one of them being in the highs. On the Flip 3, I found a slight distortion when the speaker was maxed out but that doesn’t seem to be an issue on this new model. The finger slides that used to sound a little harsh in Cinder And Smoke by Iron & Wine is now much more controlled. You can still enjoy it without it bothering your ears which is a plus. Not much has changed in the mids, with vocals still coming through loud and clear. Background instruments do get pushed off the side a bit but not enough to be an issue. The guitar and percussion in Life is Wonderful by Jason Mraz backs up the vocals perfectly throughout the track. Another minor change is in the low end, with a slightly beefier bass when compared to the previous model. It’s still not going to replicate the “sub-bass” of your favorite songs but it doesn’t do a bad job at replicating it at a slightly higher frequency it seems. The rolling bass of Mr. Rager by Kid Cudi is consistent throughout the background of the song without muddying up any of the mids. 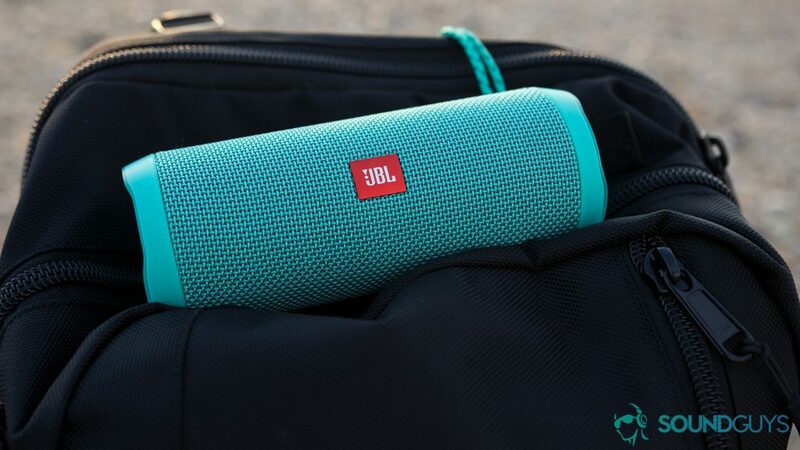 The JBL Flip 4 is a good beach buddy. The IPX7 waterproofing means that the JBL Flip 4 can be submerged in one meter of water for 30 minutes. The JBL Flip 4 controls are on the side of the speaker and are clearly defined. At max-volume, the battery falls short by seven hours; rather than 12 hours of playback time, you get five at most. One of the biggest new features of the Flip 4 over its predecessor was the addition of an IPX7 waterproof build. The JBL Flip 3 was only splash-resistant, but that might not mean much to you if you don’t know what the differences between the two are. We have a full explainer piece so you can read up all about it to become an expert, but we also put together this chart for you to hopefully make this clear. Basically, water resistance comes down to the last digit in the series. As you can see from the chart, an IPX7 build means that the product has been tested for up to 30 minutes submerged in 1m of water. The JBL Flip 4 does have a 3.5mm input if you want to hardwire in a source device, but most people will probably be connecting to it over Bluetooth. The good news is that the JBL Flip 4 does have Bluetooth 4.2, the bad news is that it doesn’t have any support for high-quality codecs. If you don’t know what a codec is, don’t worry we’ve got you covered there too. In layman’s terms, a codec is like a language. If two devices share the same language ( or codec) they can transfer data between each other faster. Unfortunately, the JBL Flip 4 doesn’t have any special codecs and just uses the default codec (or language) that all devices speak with is SBC. But don’t worry, it really doesn’t matter in this case because this speaker is meant to be tossed around and taken with you wherever you go, not for high-quality listening. Besides, you probably can’t hear it anyway. It seems every other week there’s a story in the news about how Wi-Fi and Bluetooth is causing damage to your cells, but despite the scare tactics that’s just not true. Bluetooth, as we use it, isn’t dangerous, and it won’t cause you to sprout a third arm. You can read into the details of the studies here, but the gist of it is that Bluetooth energy is what we call non-ionizing. This just means that it isn’t powerful enough to knock any electrons off of an atom and create an ion or any mutations. If you need more proof, one of the studies most cited by people claiming Bluetooth is damaging says that exposed mice showed higher levels of mutations. What they don’t tell you is that in the conclusion of that paper, the mice with the mutations actually lived longer than the control group. Remember, correlation does not causation. You can find the Flip 4 now for around $80, so is it worth it? Absolutely. If you already have a Flip 3 then you’ll have to figure out if being able to completely submerge your speaker is worth getting another. If it isn’t then you really don’t need this. But if you’re shopping for your first waterproof Bluetooth speaker and don’t want to spend a ton of money, there hasn’t been a better time do so. JBL just keeps marching forward with better and better products every time, and the Flip 4 is the next step for them. 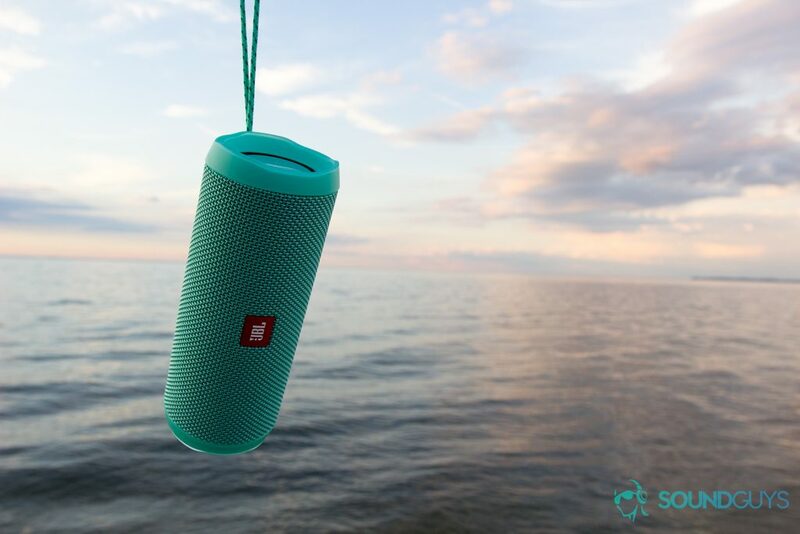 If you’re still not sure this is the right speaker for you, we have an entire list of waterproof Bluetooth speakers you can check out, as well as a few similar option you can choose from down below. If you’re checking out this review to decide if you want to get a JBL Flip 4 and find that it’s just not for you, don’t worry because there are plenty of other options you can choose from. Here are a few more speakers you might be interested in. If you’re wondering whether you should get the Flip 4 now or just wait for JBL to release the Flip 5 then this section is for you. First of all, let me say that we have absolutely no idea when the JBL Flip 5 will be announced, or even if it will be announced. That said, considering that JBL Flip series is super popular and the company has released a new one at every CES for the last few years, we’re willing to bet that we’ll see a new one at CES 2019 in January. So if you want to replace a broken cheap waterproof Bluetooth speaker or are looking to get one for the first time, you should probably just get the Flip 4. Chances are the Flip 5 will be better, but not drastically better that it’ll make the Flip 4 irrelevant. The Flip 4 still a great speaker. That said if you have an older Bluetooth speaker that’s still functioning or even a Flip 3, it doesn’t make sense to spend the money now when you can wait a month or two for the newer model (assuming it comes out). Whenever it’s release we’ll be sure to get our hands on it for a full review.